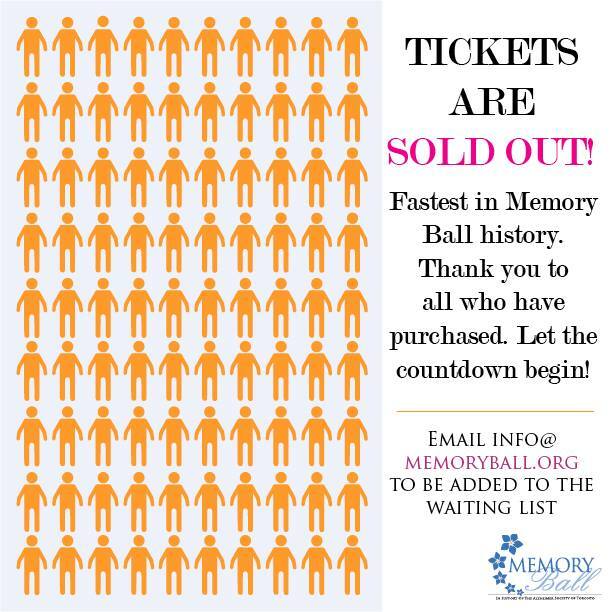 As you may have heard, Memory Ball 2014 tickets are SOLD OUT – after being on sale for 41 days with 46 days to go until the event. We knew this would be a record breaking year after selling out Early-Bird tickets in 20 hours… but to sell out even before the beginning of March really shows us how much Torontonians care about Alzheimer’s disease and related dementias. A world where nobody accepts Alzheimer’s disease as a normal part of aging. A world where Alzheimer’s disease is no longer a death sentence. Thank you for joining us on our mission and for being committed to solving Alzheimer’s within our lifetimes. If you’d like to get involved but did not get a chance to purchase a ticket, we are still welcoming donations at memoryball.org/tickets and are still accepting gifts in-kind for our silent auction. If you’d like to be notified if any tickets become available, please email info[at]memoryball.org with the subject line: TICKET WAITING LIST and include your name, email, phone number and preferred contact method. The Third Annual Memory Ball Presented by Feature Foods takes place on Saturday, March 29, 2014 at 8pm at Andrew Richard Designs in downtown Toronto. Our goal is to raise $45,000 to bring us to a combined 3-year total of $100,000 for the Alzheimer Society of Toronto.